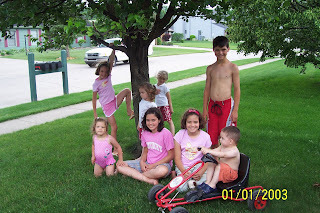 We drove to Ft. Wayne to visit my old friend, Sarah (Straub) Cresse and their 6 kids. Actually, she was still "great with 6th child" at the time of the visit, but Elianna Grace is here and squeezably beautiful. Sarah and Steve and I were friends back in college days at GBS. They lived in Utah for awhile, and I of course lived in Mississippi and Alabama. But now we've both landed in good ole' Indiana! It was such fun to get together again. 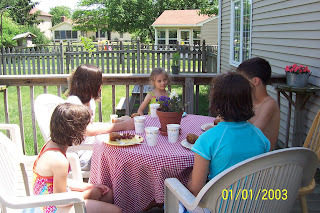 We had a yummy lunch, watched our 8 kids (plus neighbors) splash in the pool, and did some catching up. We hadn't had one of these get-togethers since Kayla was a baby. Their kids are beautiful, respectful, polite smart and fun to be around. Thanks, Sarah, for a wonderful day! No pics of Steve and Sarah? Sounds like you had a nice time. I hate it when life separates us from our friends. I wish I had done better about keeping up with my friends when I got married. We need those friendships!